When does Tree Failure Typically Happen? 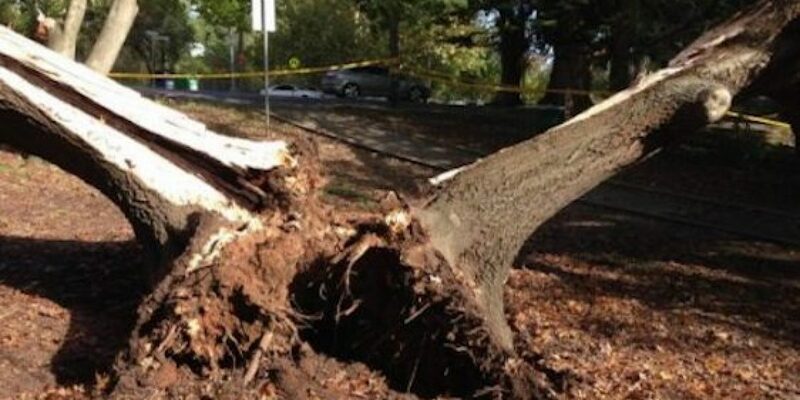 Tree failure typically occurs during windy and wet weather. In Sydney this is typically during the cooler winter months as well as following a very hot and humid day during summer when a storm front roles through. There are a few other conditions trees can fail in but I will discuss them separately. Windy weather without rain often only causes minor damage to trees. Similarly rain without wind has a tendency to cause minor damage to trees. However when rain and wind combine tree failures increase significantly. Prolonged periods of wet weather followed by heavy wind can also lead to whole tree failures as the soil can become water logged. Why does Tree Failure Occur? Trees are very good at engineering themselves but sometimes they get it wrong. This may be growth defects which lead to weakened areas in the trees. Other reasons can include insect attack and pathogens that can decay trees. Growth defects can cause weak areas in trees that when exposed to heavy wind and or rain become more prone to failing. Certain pathogens can cause wood decay leading to a weakened system. This again when put under the added pressure of windy or stormy conditions can lead to tree failure. Some pathogens progress quickly and other can co-exist with trees for long periods of time with no major issues. Very wet soils can lead to tree failure as the roots are not able to hold onto the wet soil as well as dry soil. In addition the soil is softer and can more easily compress and give way under the tree during windy conditions. A little bit like walking through mud barefooted, it squeezes up between your toes. Interfering with the clever engineering of trees can make the tree more prone to failure. Examples: cutting roots, heavy pruning, lopping and general poor pruning can all affect the strength and stability of trees to deal with stormy conditions. So is your Tree going to kill you? Surprisingly very very very very very unlikely. Trees are far safer than people tend to believe and unfortunately the media is great as portraying them as dangerous and killers. I came across this article by NatureNet which explained it very nicely. From the research it put the risk of being killed by tree in the UK at 1:20,000,00. It drew some interesting comparisons to aspects we can easily relate to such as winning Lotto or being killed in a road accident. According to his research you are 75 times more likely to win Lotto than being killed by a tree. Or even 600 times more likely to be killed in a road accident. What a sigh of relief!!! It is good practice like dental check-up to have your trees checked from time to time by a qualified arborist with AQF Level 5 training. They can assess your trees and offer recommendations. The healthier the tree the less frequent the inspections. Falling dead branches in my experience are one of the biggest causes of property damage. It is a normal part of a trees growing process and species such as Eucalypts will naturally shed these branches. Removing the dead branches from your tree every 2-5 years depending on species and health should be all that is required. We specify the size of dead branches we remove when pruning. The smaller the diameter of the deadwood, the more noticeable the difference and the less you have falling out. If the inspecting arborist finds a defect in your tree they will be able to offer options as to how best deal with it. Our last resort is for complete tree removal, however sometimes this is the most sensible option depending on the condition and location of the tree. In many instance selective pruning of weakened or faulty section may be all that is required. NOT identifying and dealing with defects can result in partial and or complete tree failure that could have been prevented. Before deciding to cut any roots on trees I strongly recommend you seek the advice of a consulting arborist. Remember the roots are what keeps the trees standing upright! !